Last Updated: April 17, 2019 · Published: August 14, 2017 By: Asian Caucasian Leave a Comment This post may contain affiliate links or sponsored content. Let’s face it, what makes an Asian dish great? The sauce, of course! 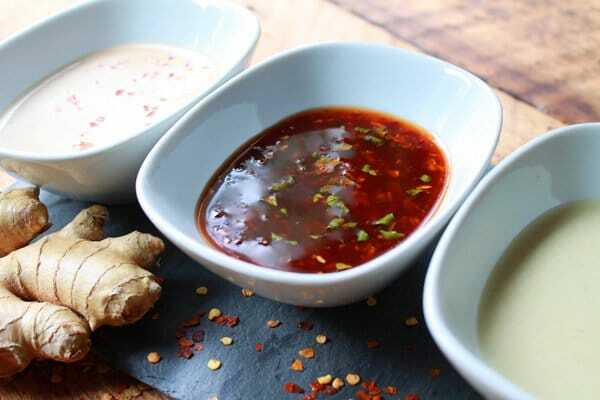 Here are three fantastic Asian sauces that will turn an ordinary recipe into extraordinary! They are super easy to prepare, with very few ingredients. The sauces are paired with three of our recipes, but you can use these sauces with so many things to dress up any dish. Mix it into your stir-fry, toss it with noodles, use it as a dipping sauce… the possibilities are endless! Sweet, spicy, delicious Asian flavors like soy sauce, garlic, ginger, rice vinegar, coconut milk, green curry paste, and peanut butter. You can shop the ingredients below. Super simple! These Steamed Vietnamese Rolls are awesome with this spicy dipping sauce. 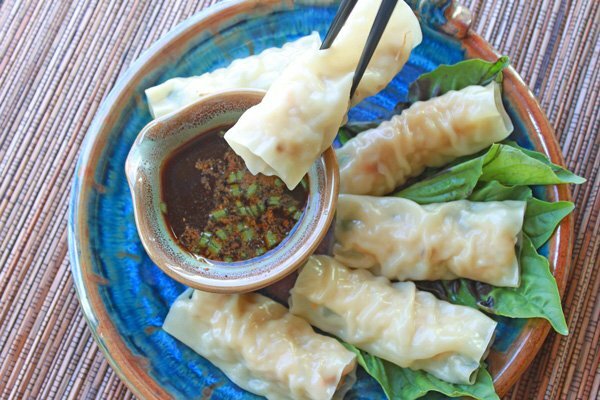 The sauce also pairs well with spring rolls, wontons, seared tuna, and dumplings! Whisk together the chili sauce, sambal oelek, mirin wine, ginger, lime juice, soy sauce, and fresh basil. Serve alongside the steamed rolls for dipping. 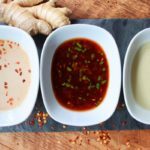 This amazing dipping sauce tastes great with Vietnamese spring rolls, seared tuna, wontons, dumplings, and more! 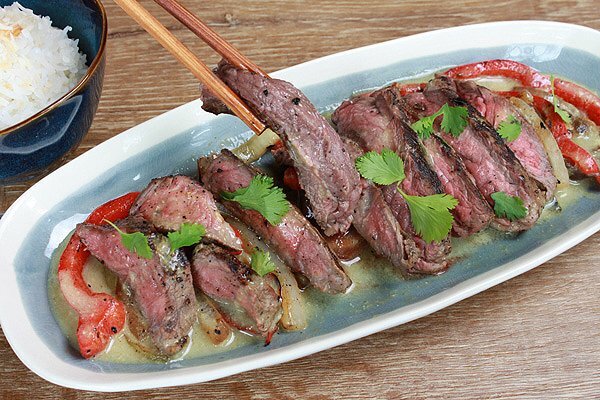 Our Grilled Beef with Green Curry Sauce is to die for! The sirloin soaks up the flavors of the coconut milk and green curry paste. You can also use this sauce on rice and noodle dishes, or chicken! In a small saucepan, combine the coconut milk, curry paste, and sugar. Stir over low heat until desired thickness. Season with the fish sauce. A delicious sauce that’s perfect over vegetables, noodles, rice, tofu, chicken, steak, and more! Who doesn’t love chicken on skewers? 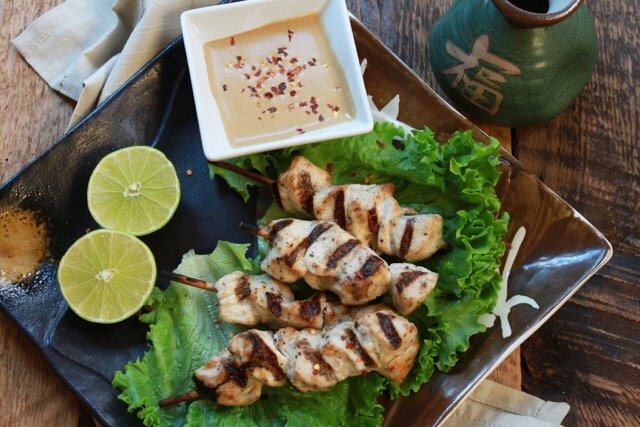 This is the perfect spicy peanut dipping sauce for our Chicken Satay Skewers. The sauce also pairs well with salmon, spring rolls, seared tuna, and more! This sauce is great for chicken skewers, salmon skewers, or as a dipping sauce for spring rolls.